are used and /or come from monolingual Spanish homes and have attended preschools where English is the medium of instruction" (Escamilla, et. al., 2014). While one language may be slightly stronger, the research I have presented leads me to the conclusion that best practice for ELL students, if you want to classify them that way, is to deliver literacy instruction in carefully planned English and Spanish instruction from Kindergarten on. This kind of careful planning will involve making sure that concepts are connecting meaningfully across languages, and to ensure that students are not simply receiving double doses of the exact same lesson, translated into the other language. While researchers acknowledge the importance of using approaches such as sheltered instruction in English (often referred to as SIOP: Sheltered Instruction Observation Protocol), especially in the content areas, "research has concluded that it is insufficient for teaching literacy and language arts to emerging bilingual children", touting instead the need for direct instruction of both English and Spanish literacy. Biliteracy instruction capitalizes on all of the child's linguistic resources. Dr. Ofelia Garcia explains the importance of this concept with what she calls translanguaging – that students must use their full linguistic repertoire for meaning-making (2013). This includes everything they know in and about both languages they are developing, as there is linguistic interdependence between them. The short answer, based on my research in this program, is to teach literacy in English and Spanish, using best practices from each language while honoring the value of both in the classroom. However the world of bilingual education is still relatively young. I look forward to seeing research continue to grow in this area as we respond to the ever-changing population of students we serve. Arteagoitia, I. (2013, November). Cómo desarrollar conciencia de la similitudes y las diferencias entre el inglés y el español. La Cosecha Conference. Lecture conducted from Dual Language Education of New Mexico, Albuquerque, NM. Beeman, K. & Urow, C. (2012). Teaching for Biliteracy: Strengthening Bridges between Languages. Philadelphia, PA: Caslon. Bolos, N. (2012). Successful Strategies for Teaching Reading to Middle Grades English Language Learners. Middle School Journal, 44(2), 14-20.
de la Luz Reyes, M. (2012). Spontaneous Biliteracy: Examining Latino Students' Untapped Potential. Theory into Practice, 51(4), 248-255. Garcia, O. (2013, November 7). Global Constructions of Spanish, Bilingualism and Bilingual Education: Implications for US Latinos. La Cosecha Conference. Lecture conducted from Dual Language Education of New Mexico, Albuquerque, NM. Howard, E. R., Sugarmen, J. & Christian, D. (2003). Trends in Two-Way Immersion Education: A Review of the Research, Report 63 (R117-D40005). CRESPAR/Johns Hopkins University. Baltimore, MD. López Estrada, V., Gómez, L. & Agustín Ruiz-Escalante, J. (2009). Let’s Make Dual Language the Norm. Educational Leadership: Supporting English Language Learners, 66(7), 54-58. TEDxTalks. (2013, May 3). No Child Left Monolingual: Kim Potowski at TEDxUofIChicago. Retrieved from http://www.youtube.com/watch?v=pSs1uCnLbaQ. Thomas, W. P. & Collier, V. P. (2003). The Multiple Benefits of Dual Language. Educational Leadership: Teaching All Students, 61(2), 61-64. 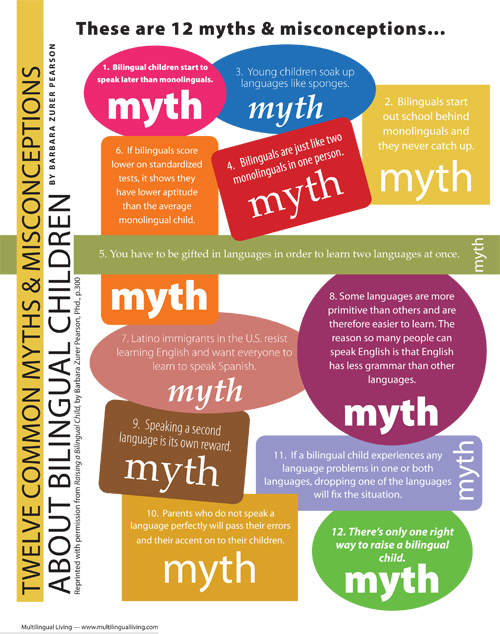 Left: Myths about bilingualism [graphic]. Retrieved March 19, 2015 from http://www.speechbuddy.com/blog/speech-therapy-techniques/raising-a-bilingual-child-with-at-home-speech-therapy/. 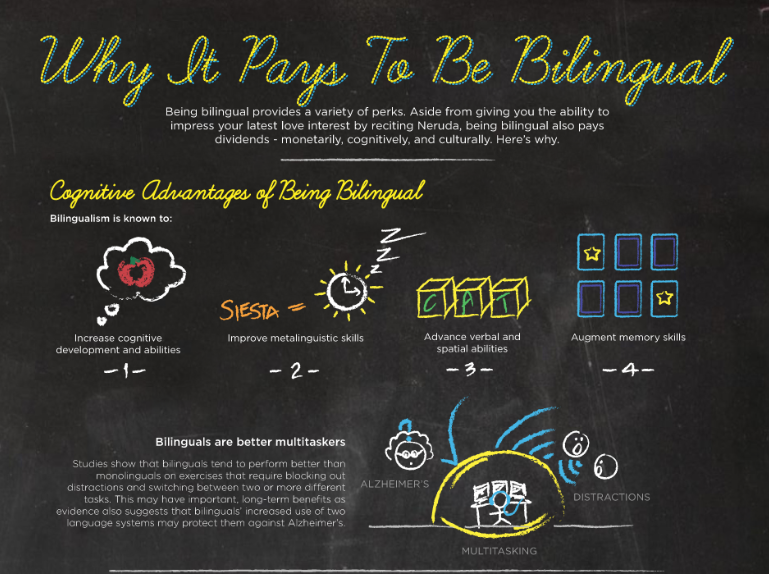 Right: Why it pays to be bilingual [graphic]. Retrieved March 19, 2015 from http://www.speechbuddy.com/blog/news/bilingual-kids-get-a-boost-benefits-of-in-home-speech-therapy-for-multiple-languages/.